if you don't see it listed, please ask, if we don't have it, we'll tell you where to look? Okay here's the drill, if you see something you are interested in please e-mail us at sales@thebusco.com to verify that an item is still available or to inquire about it. 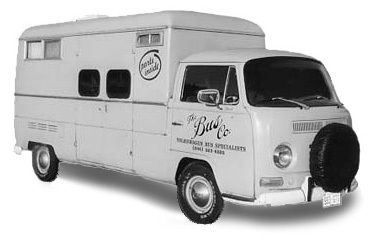 The Bus Company was created to provide products for the maintenance and restoration of the Volkswagen Type II (van,bus,camper,pick-up) made from March 1950 through July 1979. The Bus Company sells and ships bus parts, GOOD USED STOCK. We have hundreds of parts on hand. If we can't save the whole bus, we save all the parts! Parts are tested, cleaned, labeled and put on a shelf. Photos of the actual part are always available. "Used" is frequently half or less the price of "repro" and way less than "NOS" or "DEALER". Something's you don't want "used" (brake shoes, clutch cables) or need "NOS" (brake shoes, clutch cables), the aftermarket is best. A lot of things aren't available "repro" or "dealer" so "used" is good. Also some "repro" just aren't as well made as original. Please check back often, as I'm continually getting new (old) stuff. I have lots of parts still to include in my database, so let me know what you are looking for, I might have it, or I will let you know if /when I get your part in.